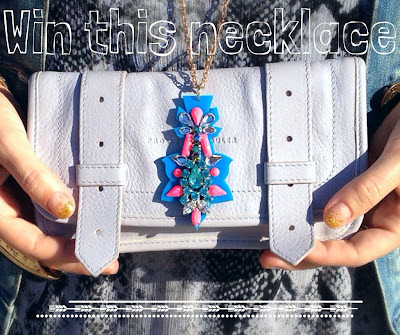 I am so excited to partner with UK accessory brand GreenEyeRocks for my very first giveaway! 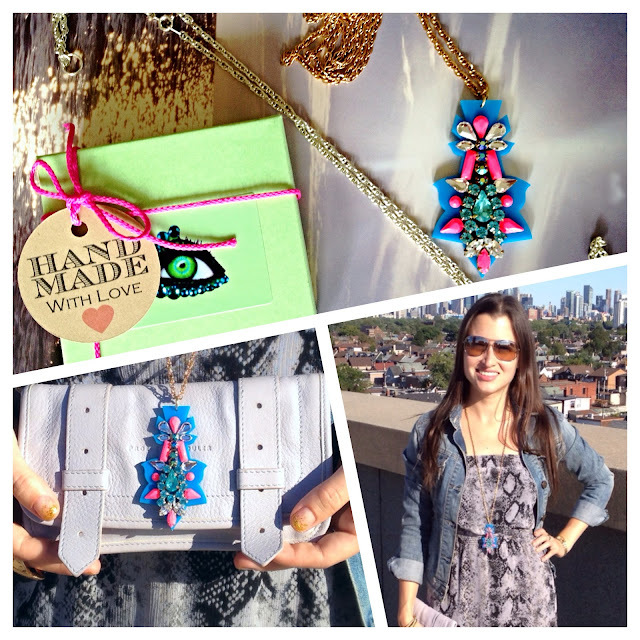 You can win this stunning statement pendant by GreenEyeRocks, handmade with vintage rhinestones on neon laser-cut perspex, with both a gold & silver chain to match any outfit. This necklace is valued at over $150, and is completely one of a kind! You'll be sure to draw stares with this killer unique piece. That's it! Contest is open internationally, the winner will be announced Friday, September 20th. Good luck! ps. Can't wait for your posts on fashion week and all the trends to come. And love the blog!!! I would style this beautiful piece in many different ways. But its first time out would be over a long pale pink, long sleeved linen dress. and this would be the only piece I would wear, no earings, no bracelets....would also style it with turqiuise Sari. The necklace is so beautiful... 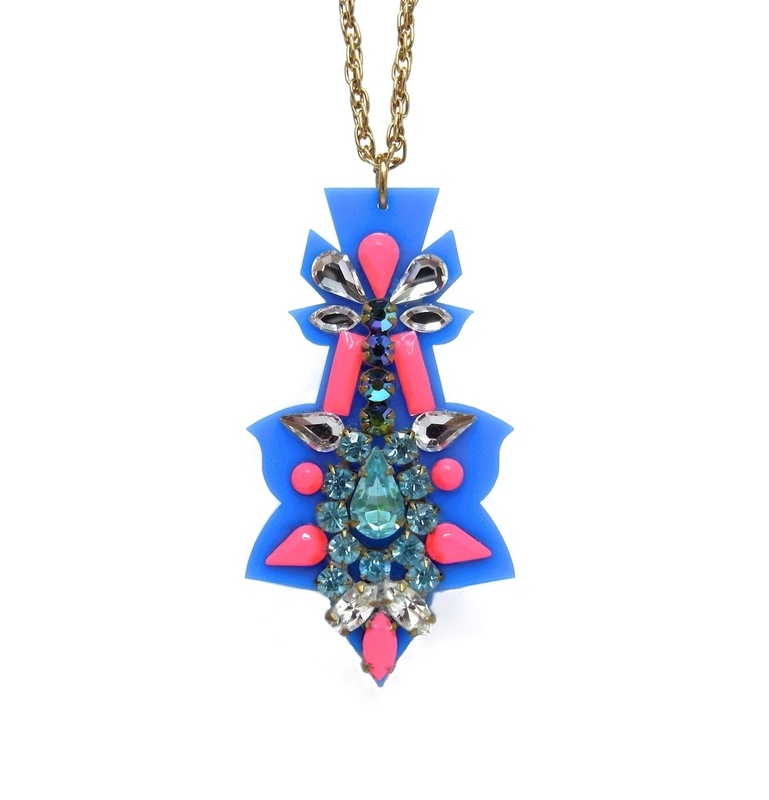 I think a white shift dress, great wedged shoes and this necklace would be fantastic. All black dress in the back to make this colourful little piece of neck candy pop, sizzle and buzz electric. I would wear a white peplum top, black skirt and wear heels that match that gorgeous necklace. A nice white boatneck top along with a blue denim skinny Jean or tan or olive green skinny khakis with a bootie and a clutch with a color from the necklace in it.... preferably green. I want the necklace to standout and be the center piece everything else can be simple. This would look amazing with my favorite LBD. Such an amazing piece! Black top, blue jeans and leopard print flats.